I wonder what she would have called my baby boy. Ms Shirley called my first baby, “Princess.” It was premonition, I think, knowing this tiny newborn would be a ballerina princess who only wore dresses from the ages of two to six. Then one Wednesday night my oldest daughter clung to Ms. Shirley while screaming in hysterics, wanting to stay in the nursery with her rather than come home with us—her very own parents! 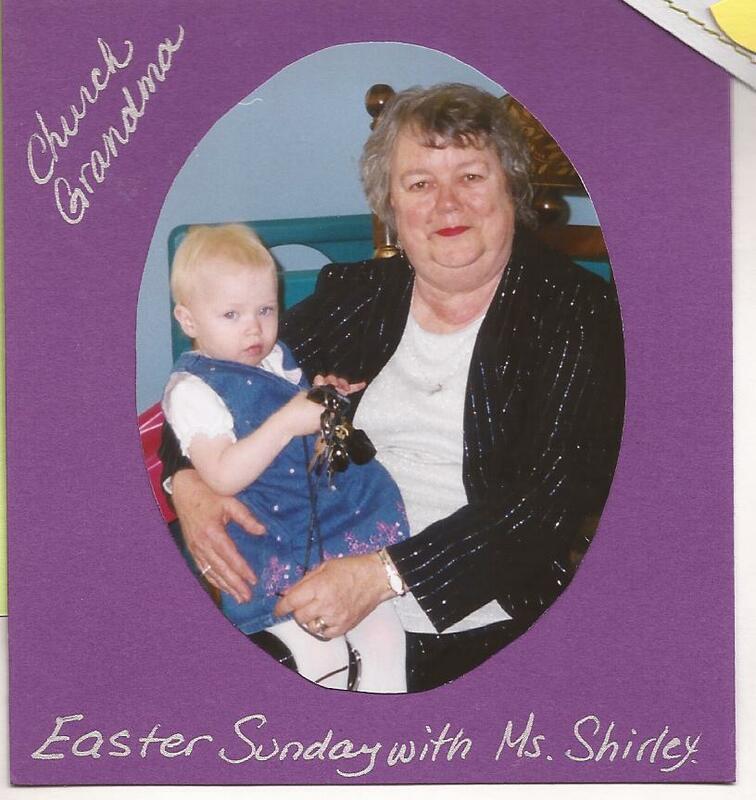 That was the last time we really saw Ms. Shirley other than a hospital visit after her car accident on Veteran’s Day weekend all those years ago. I guess Victoria knew in her Spirit that God was calling her Church Grandma home and didn’t want to leave her side one second too soon. She left this deep imprint on our lives, so deep I can still feel the tenderness of her memory years after she last held my children and gave them nickname s.
This is the power of legacy. And I think, as I sit here now, that legacies so rarely involve fame on a grand scale or power or high position. Ms. Shirley loved my children. That’s how she poured out a generous abundance of blessing on me, a young mom trying to serve in the church. Yesterday, I sat in our church library overwhelmed by God’s goodness and the sweetness of our church family. Next to me sat a pile of my very own books on a table. How this is God’s grace. I’ve been writing all along. Your lives are a letter written in our hearts; everyone can read it and recognize our good work among you. Clearly, you are a letter from Christ showing the result of our ministry among you. This “letter” is written not with pen and ink, but with the Spirit of the living God. It is carved not on tablets of stone, but on human hearts. (2 Cor. 3:2-3). No matter how much I write in my life, no matter how successful (or not), no matter how much or how little impact my words may have, my greatest writing is written on human hearts. So it is for you, as well. You know, the longer I live the more I realize that all that’s important in this life is God, and people, and connecting the former with the latter. I’m willing to shed a lot of things to strive after the Important (Disciplines of a Beautiful Woman). Your body will age. Your clothes will become dated…..But the waves of your life and influence will continue to live on and ripple through the hearts, minds, and faith of your children (p. 198). We are so often glorifiers of fame and students of worldly success, but impact always trumps personal glory. Ms. Shirley taught me that by serving in a church nursery. I’m learning that every day as a wife, mom, and friend. We all are writers on human hearts and the messages we imprint on the lives of others are the greatest ‘work’ we will ever produce and the most beautiful offering we could give to God. Never forget what matters, not while you care for a newborn, potty train a toddler, answer a preschooler’s questions, help a child with homework, love them through the difficult days and the joyful moments. Never forget it as you serve in the church for little glory or recognition that the letter you are writing is beautiful, precious to God, and worth more than any bestseller.